Are you experiencing heavy, painful, or swollen legs? If so you may be suffering from chronic venous disease, a progressive disease that needs to be treated. Chronic venous disease affects the valves in your veins, whose primary function is to prevent blood from flowing backward. As a result, damaged valves cause blood to flow back into the veins, pooling in the lower leg. This increased fluid can cause pain, edema and a sensation of heaviness which can worsen over time. If you think you are suffering from chronic venous disease, it is important to seek treatment. 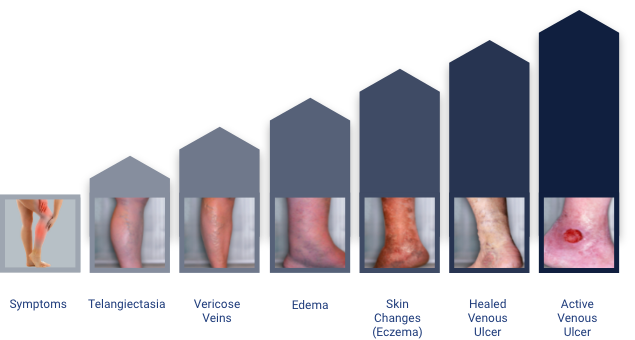 Left untreated, chronic venous disease can progress and worsen over time, making existing symptoms worse and new ones appear. Seek treatment at the first sign of symptoms as chronic venous disease can worsen over time. If you regularly suffer from at least one of the symptoms of chronic venous disease, take the Veinscore Assessment and speak to your pharmacist or physician about the best treatment for you. Leg pain, heaviness, and swelling are warning signs of chronic venous disease. If untreated, symptoms of chronic venous disease may increase in severity, leading to: spider veins, varicose veins, and leg ulcers. If you are experiencing any of the signs of chronic venous disease, it is important to speak to your pharmacist or physician about treatment options. Treatment of chronic venous disease is essential to maintaining healthy legs. If you think you are suffering from any of the associated symptoms, speak with your pharmacist or physician about the best treatment for you. Venoactive treatments help to relieve the symptoms of mild-to-moderate chronic venous disease. Venoactive treatments may be used in tandem with other treatment options, such as compression therapy. A natural health product made from small, immature oranges, Venixxa™ provides relief for the symptoms of mild-to-moderate chronic venous disease symptoms. Now available in Canada, Venixxa™ has been used in more than 33 countries for over three decades and receives the highest recommendations from international medical societies. 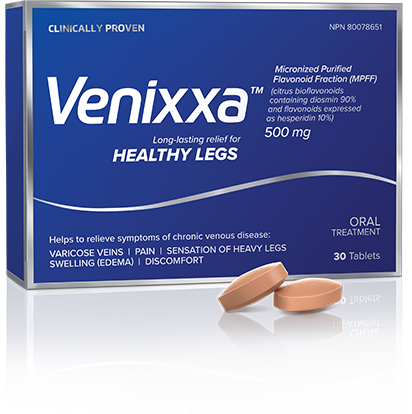 If you suffer from mild-to-moderate chronic venous disease, ask your physician or pharmacist about Venixxa™. Compression therapy involves the use of compression stockings to gently squeeze together the walls of the veins, enabling the valves within the vein to close, helping to increase circulation. The improved blood flow helps to limit the pooling of blood within the lower legs, reducing the symptoms of chronic venous disease. Compression therapy is often paired with venoactive treatments for the management of chronic venous disease. It is recommended to speak to your physician or pharmacist about appropriate treatment options. Endovenous laser treatment involves the use of laser light to collapse damaged veins. This laser is delivered through a small fiber inserted into the vein with a needle. Radio frequency ablation utilizes heat to collapse damaged veins and is delivered by a catheter inserted into the vein. Sclerotherapy involves the injection of a saline or chemical solution into damaged veins. This injection causes the veins to collapse and be reabsorbed by the body, reducing their visibility. The procedure is minimally invasive. It is recommended to speak to your physician about the best treatment for you.